It's 7:15 am and our mixed group not only by nationality and gender, starts the journey of the second day to Babino Polje, Montenegro. 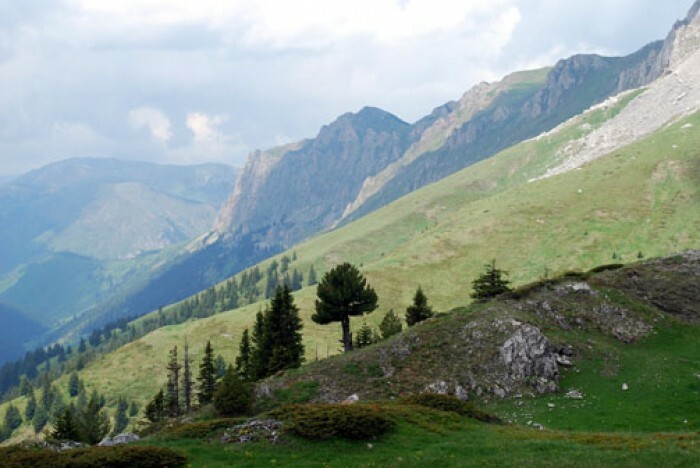 Gjemajl Kelmendi, part of the Kosovo group, and also vice president of the Federation of Kosovo Highland of climbers, informes us that the terrain will be very rugged, as it will go up over 1000 meters from the current height, then descended to about 500 meters. The first rest stop is a source not far from two lakes in the vicinity of Roshkodoli Mountains. Shkodra Path has received this name because there were the way tie between Peja and Thethi of Shkodra. At the place called Zavojë becomes the difference between those who experience for the first time this trip and the professionals who "leaves the shade to us" by capturing the former border with Montenegro. According to Endrit, the GPS shows that the height at the crossing point between Kosovo and Montenegro is 2470 meters. At 16:15 arriving in Babino Polje, where Stanica, GIZ representative in Montenegro who introduces us with the police forces making the casual geetings, in a friendly Serbo-Croatian. Since the passage is not in the official border crossing points in the three states, the police forces have offered us this extra service, after a request of the GIZ to all countries where will pass our pilgrimage. In Babino Polje, we get accommodation in a two-storey wooden lodge, which is newly built, owned from Vasvije Alija, 61 years old. All her family welcomed us very warmly and spend the night there, relaxing to get ready for tomorrow. Montenegro. 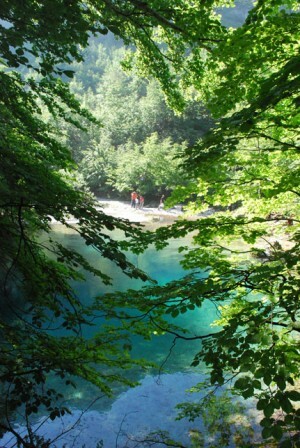 Afternoon we visited the Ali Pashe Gucia springs, a natural majestic source about 5 km from the town of Plava. The crystalline water resource stands in synthony with the two farms and the buildings built since the former Yugoslavia. They are out of order, which makes me think that still have not passed the process of privatization. Near of, a new business has taken shape, it is the restaurant named "Krojet" (Springs), a very grand building, built half a glass and a half stone. place a few days ago said that is not good for bunkers to be destroyed, after they heard that the Albanian government paid about 140 Euros to destroy one of them. Just a few meters of climbing, we look beyond the ruins of the border post, which had functioned only during the summer. The Arapi height Peak 2217 meters, appeared more magnificent, while in the valley in front of, four tents were fitted with three different colors, which were closed. Surely their residents had to bein the expedition now . After many steps laid carefully on the descent of the Gorge of Peja, comes a point where we should be more careful in its reduction, in our journey, while enjoy the amazing panorama of Thethi, final destination for the most of our group. Interested in the Peaks of the Balkans? Travel with the experts! Zbulo! Discover Albania is member of the steering committee that manages the project and helped to create the trail. We run guided tours for groups and individuals, help independent walkers to obtain border crossing permits and provide ground service for outbound tour operators. Trips can range from 7 to 15 days, start and end in each of the three countries and be tailored to your requirements. What makes us unique is the extensive knowledge of the region. Benefit from the best choice of stages, trails, side trips to summits, cultural sights and the best accommodation. Zbulo! is Adventure Travel Trade Member, contributes to local projects and has high principles aimed at responsible, sustainable and environment friendly travel. We are looking forward traveling with you.